Our wide assortment of men's keychains feature classic Lazaro themes such as ravens, fleur-de-lis, and skulls. 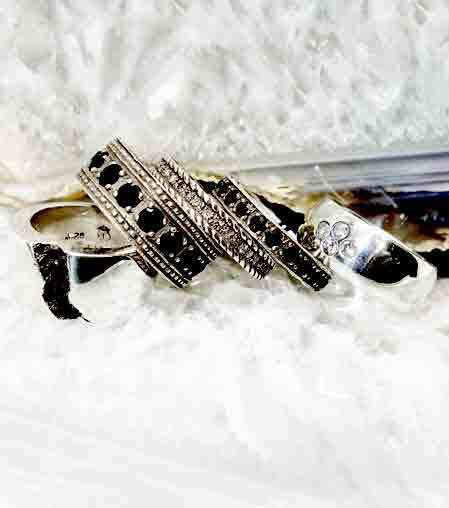 Crafted with top quality materials like genuine leather, silver, and brass, these top tier designs cannot be found anywhere else. 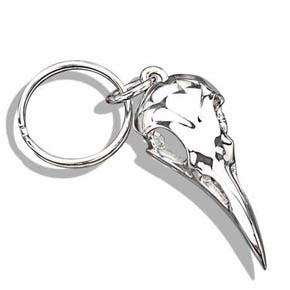 This handmade white brass keychain features a polished brass raven skull. 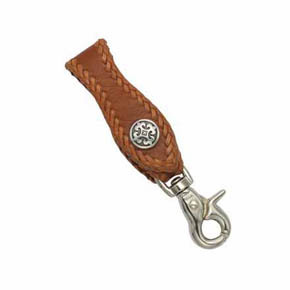 Genuine leather belt key fob for men with a stainless steel snap closure and trigger snap. This 6" hand laced men's key fob with a fleur de lis is made from genuine red sting ray leather. Black sting ray leather belt key fob for men with fleur de lis. This 6" hand laced men's key fob comes with a stainless steel closure and trigger snap. Stainless steel closure and trigger snap on a hand laced men's key fob. This 6" black cow hide leather belt key fob for men is detailed with a fleur de lis. 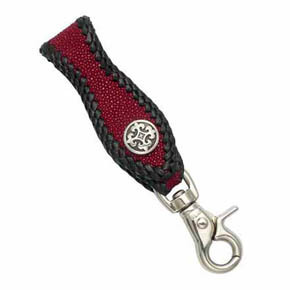 Hand laced belt key fob for men made with red sting ray leather with a durable stainless steel snap closure. The Maltese cross on this 3 3/4" men's key fob is classic. The fleur de lis on this 3 3/4" men's key fob looks great. 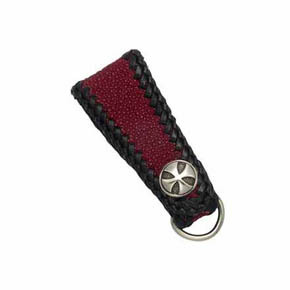 This hand laced red leather key fob for men is made with genuine sting ray leather and black cowhide lacing. Red sting ray leather belt key fob for men with black cowhide lacing. 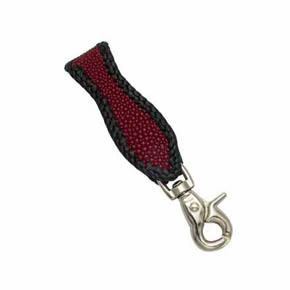 This hand laced 6" men's key fob looks great and comes with a durable stainless steel trigger snap. This hand laced men's key fob is a 6" black sting ray leather belt key fob for men detailed black cowhide lacing comes with a durable stainless steel trigger snap. This 6" men's key fob comes with stainless steel trigger snap. Hand laced genuine red sting ray leather key fob for men features a sterling silver skull detail and sturdy stainless steel snap. This 6" black genuine sting ray leather key fob for men features a sterling silver skull detail and sturdy stainless steel snap. Hand laced men's key fob comes with stainless steel trigger snap. 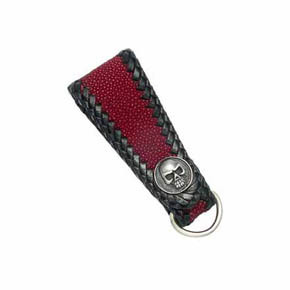 Red leather key fob for men with sterling silver skull detail and sturdy stainless steel snap. This 3 3/4" hand laced men's key fob is made with genuine sting ray leather. Hand laced men's key fob with Sterling silver fleur de lis detail and stainless steel snap closure and trigger snap. This 6" tan leather belt key fob for men is one of our many leather goods featuring genuine cow hide leather. 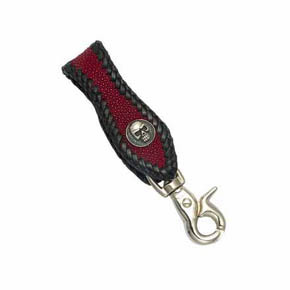 3 1/4" Red stingray leather belt key ring with stainless steel snap closure and a trigger snap. 3.5" Stainless steel handmade belt clip featuring black stingray and high quality leather. 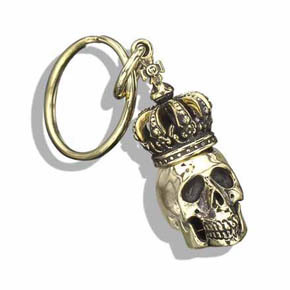 This handmade yellow brass keychain features a brass skull adorned with a crown.